This is the hard way to get to the summit of 7,242′ Black Elk Peak, the highest in South Dakota. 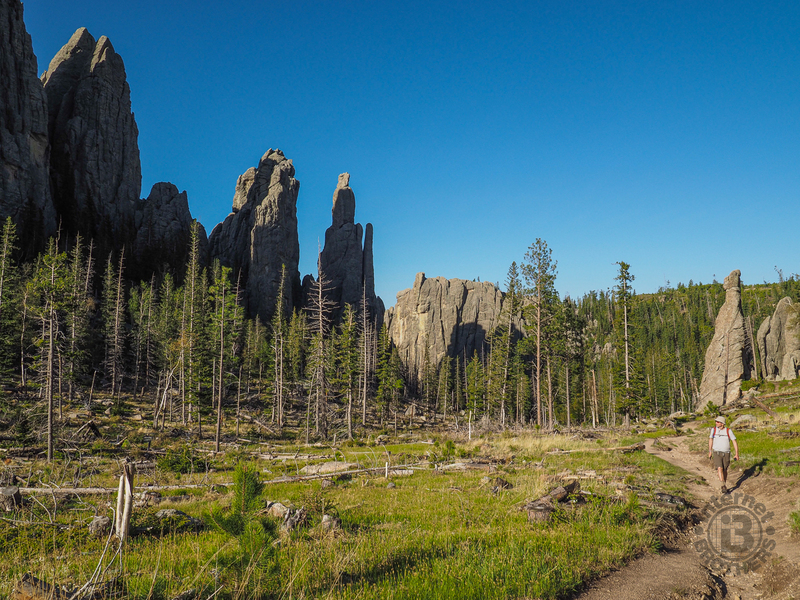 But, it affords you the opportunity to hike through the incredible Cathedral Spires, massive granite pinnacles that dominate the landscape in the Black Hills National Forest. 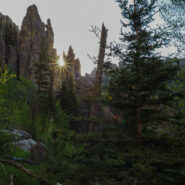 Between the spires and the summit you pass through the rugged Black Elk Wilderness, named for an Oglala Sioux holy man. Craggy peaks and rocky slopes mixed with ponderosa pine, spruce and fir trees make for a varied ecosystem. My brother Dave and I hiked this demanding circuit on Saturday, May 26, 2018 beginning about 6:15AM and finishing at 12:45PM. Our plan was to start on the Cathedral Spires Trail, connect to the Little Devils Tower Trail (#4), then to the Norbeck Trail (#3), and finally the spur trail to the summit of Black Elk Peak, returning the same way. Hike Rating: Difficult. Very strenuous. Not many respites on this hike. Trail Condition: Fair. Very rocky and rooty in places. Some trenching from overuse. Starting Point: Parking area on Needles Highway. Room for about 20 cars. Trail Traffic: Literally hundreds, although we had the Cathedral Spires Trail all to ourselves just past dawn. It began getting crowded when we reached Norbeck Trail. Better to do this hike on a weekday. How to Get There: From Custer, SD take Hwy 89 north 7 miles to Hwy 87. Turn right on 87 and proceed past Sylvan Lake to Needles Highway. Go 2.5 miles. The parking for the trailhead is in a hairpin turn past the Needles Eye Tunnel. Trailhead is across the road marked with a plaque embedded in a stone. After driving along the Needles Highway and seeing Cathedral Spires, then discovering there is a hiking trail that goes up in there, Dave and I said to each other, “we have to do that.” Then we learned the Cathedral Spires Trail also connects to one of the pathways to the summit of Black Elk Peak, another of our plans, and we were set. We would combine the two. We discussed this with our friendly receptionist at the fine Econolodge in Custer to see if this seemed like something that two 60-somethings could handle, and she said absolutely. Go for it! We noticed when driving by a couple days earlier that the parking for Cathedral Spires Trail was full in the afternoon, and since we tend to be early risers anyway, we were at the trailhead by 6:00 and got the first parking space. That also meant we had the 1.4 mile climb up into the middle of the spires all to ourselves. Just us and the sunrise. The trail climbs about 400 feet right off the bat, then levels out for a bit, before one final surge up to the spires. We thoroughly enjoyed the sun peaking up over the granite monoliths of the Black Hills creating a golden glow across the limber pine forest. This area, annexed by Custer State Park, became a National Landmark in 1977. The awesome spectacle of the spires, and the disjunct limber pine forest make it totally unique. 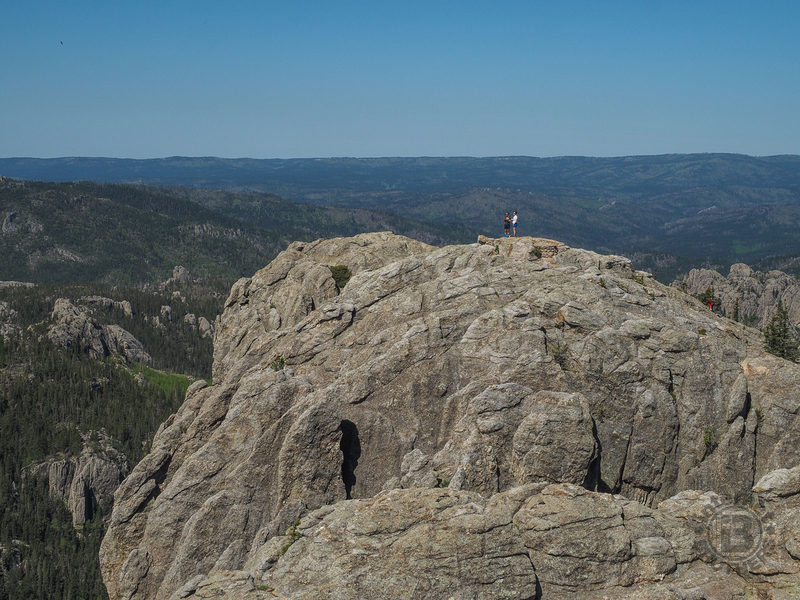 As you get higher and higher, be sure to look behind you as well for the stunning view into the wide expanse of Custer State Park. This northwestern corner is mountains, but the majority of the park is rolling plains and prairie. After about a mile and a quarter you’ll reach a trail junction. To the left is the way to Black Elk Peak, but take the right turn just so you can walk among the spires. It’s another tenth mile to a dead end that gives you a good feeling of the massive size of the Cathedral Spires. The sheer walls are straight up, so you can imagine them to be quite popular with rock climbers. Later in the day, on our way back down, we discovered some climbers had been behind us on the trail this morning. We were the first to arrive at Cathedral Spires on this beautiful late May morning. About the only thing that spoils this magnificent scenery is the remediation work done by the U.S. Forest Service and S.D State Forests all throughout the Black Hills in an effort to tame the destruction of the pine beetles that have infested western states in recent decades. There is a lot of dead wood… some from the beetle kill, and some taken down by foresters to prevent the spread. It’s a shame. I’m sure this used to be an immaculate pristine forest. After scoping out the spires, it was time to begin the ascent to Black Elk Peak, so back to the junction we went. The trail begins climbing in earnest right away, then you come to a right turn on the Little Devils Tower Trail (#4). Trail 4 climbs a while longer, then surprisingly makes a rather marked descent of about 140 feet through a dark and healthy pine forest. Don’t you just hate to give up hard earned elevation, only to get to climb it all over again? It also means, of course, that you will have a climb on your way back down too. As the trail begins ascending again you pop into the open at the base of a giant outcrop with several logs for benches and seats. It’s a nice place for a break and a nourishing snack. We checked our map to make sure we were in the right place, and pressed forward. Soon after the snack break we entered a section of forest with extreme beetle kill, then came to the boundary for Black Elk Wilderness. The wilderness here, designated in 1980, was named after Nicholas Black Elk, an Oglala Lakota Sioux medicine man who was a cousin of the war chief Crazy Horse, and an important source of Native spiritual teachings. Prior to 2016, Black Elk Peak was known as Harney Peak, named after a pre-Civil War Army general who led his troops against the Sioux in a long and brutal war. To honor Nicholas Black Elk’s legacy, Harney Peak was renamed to Black Elk Peak in 2016. As you wander around the western South Dakota area, you will notice the locals sometimes still refer to Harney Peak, as they’re still getting used to the name change. 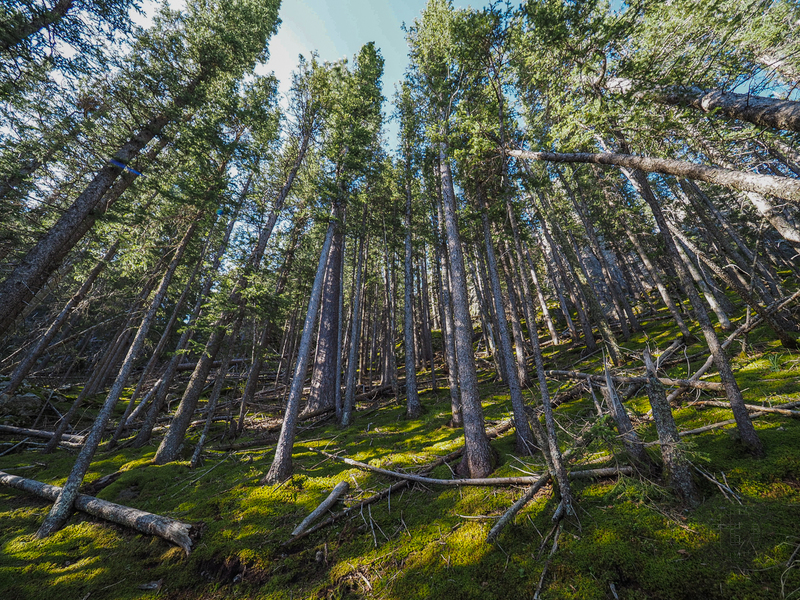 After the area of dead forest, you enter a section of totally healthy new growth pine on a bed of verdant moss. Here we encountered our first hikers of the day, as they were coming down from the peak, obviously starting in the dark. They assured us we were on the right path, and wished us well as we continued our adventure. A pleasant forest of moss and pine contrasts with all the unfortunate beetle kill. About a mile into the wilderness you come to the Norbeck Trail (#3) junction and take a right turn. From here you make the final push to the summit, probably the hardest climbing of the trek. The forest opens up significantly and you can begin to see the Black Hills that surround you. It is a rocky, otherworldly terrain. Behind you is Cathedral Spires and to your right (east) is the region that includes Mount Rushmore National Memorial. There is also a wealth of wildflowers up here, mostly the cheery prairie goldenpea, a bright yellow clustered flower that we had been seeing all over since our arrival in the Black Hills region. About a quarter mile from the summit, you have to make a left turn onto a spur trail that takes you the rest of the way. There is a small sign there that simply says Harney Peak with an arrow. They obviously haven’t gotten around to renaming the sign yet. Soon after joining the spur trail, there is a great overlook with views in every direction. It’s a good preview of what’s coming later as you reach the summit. A bit farther up the trail, the stone fire tower that sits atop the summit comes into view for the first time. The tower was built by the Civilian Conservation Corp in the 1930s. The final hundred feet of climbing is on stairs, some stone, some iron, and some masonry compliments of the CCC. The fire tower itself is retired now, but still open so you can wander around. There is a rain water impoundment pond and pump house at the summit, and several view points accessible by walking the gnarly granite. Be careful near the edges though, as the wind can really gust here. It was blowing 30-40 mph on the day we were there. The granite high point at 7,242′ is sacred ground to Native Americans, especially the Sioux. It was upon this peak towering over the Sioux Nation that a young Black Elk experienced a vision. Many years later he would recount that vision publicly as he evolved as a respected elder and medicine man. You will still notice prayer ribbons tied to trees on the summit. Be careful near the edges as it is very windy on Black Elk Peak. From the summit vantage points you can see the back of Mt. Rushmore. We compared photos of the stone formations surrounding the monument to assure ourselves what we were looking at. You can also pretty much trace your steps through Cathedral Spires and the areas of forest on your way up to the summit, and also the way we would be heading back down. After about 30 minutes of fighting the wind and the crowd of a hundred with us on the summit, we decided it was time to begin the descent. But first, we found a nice log beneath a couple pines away from the crowd to enjoy our lunch and refill for the hike back. There were a whole lot more people coming up as we were going down. For what it’s worth, I don’t recommend doing this hike on a Saturday that also happens to be Memorial Day weekend. We should have planned our timing better and done this on a weekday. Our return trip was uneventful, except for a couple things worth mentioning. When we got back to the forest where we had to climb back up the 140 feet, we could see the tower on the top of Black Elk Peak through the trees. We never noticed that on the way up. Also, when we got back to Cathedral Spires there were a couple of climbers standing on the top of one of the tallest spires. Better them than me. No thank you. After we got back to the car, we still had several hours of afternoon left, so we took a drive on the Iron Mountain Highway in Custer State Park that offers long distance views of Mt. Rushmore as well as Black Elk Peak. I’ve included a couple of those photos in the gallery below for perspective. Also, we visited Stockade Lake, one of several reservoirs found in the state park. In summary, if you enjoy rugged mountain terrain, and tough tests of your hiking endurance, put this one on your list when you visit western South Dakota. In addition to The Badlands, Wind Cave, and Custer State Park, you should check out some of the trails in the Black Hills National Forest, this one among them. If you are a peak bagger, you can check off a state high point. You undoubtedly get the best view of the surrounding mountains and plains from the summit. Just be sure to take plenty of water and energy with you. For what it’s worth, there are several other ways to get to the summit of Black Elk Peak. There are two trails from Sylvan Lake, and the Harney Peak Trail starts north of the summit. All of these are also difficult, but perhaps a bit less demanding than also including the Cathedral Spires Trail like we did.